Just a few kilometres away from Brussels, you can find 127bis, a detention centre that houses around 100 undocumented migrants. The detention period is meant to be short-term, but behind the building's walls, people are being held like prisoners. Earlier this year in May, the Steenrock festival took place just outside the centre's gates. Their goal? "Make music, not detention centres." Two buses are stationed at the Cinquantenaire Park, in front of the Royal Museum of the Armed Forces and Military History. While they may look like tourist buses, their actual purpose is to provide a free shuttle service to festival-goers. After a volunteer checks that this is the coach I'm looking for, I climb in and sit behind a woman who is on her own, and in front of a couple in their forties. Twenty minutes later, we arrive at Nossegem station, a few hundred metres away from Brussels international airport. A group of around 100 people are already in the car park where the bus drops us off: adults, children, teenagers and elders, having arrived here on foot, bicycle, motorcycle and by car. The police are also present, keeping a close eye on everyone from their cars. From here, the crowd will make their way together to the Steenrock festival, which takes place next to the airport runways. What is much more significant, though, it that it is also situated next to the 127bis repatriation and detention centre, in Steenokkerzeel. Locked up inside, behind two rows of wire fencing, are undocumented people. In the best case scenario, they will be granted asylum status. In the worst case scenario, they will be sent back to their country of origin or to the first EU country they were controlled in, according to the Dublin II Regulation. "Madam, they won't let me leave"
Flora is a midwife, and she has come to the festival to show her support for fundamental human rights. When I ask her if she thinks that events like this could have an effect on Belgian immigration policy, she replies: "I don't think so, but in a humanitarian sense, it is important to show support for people as it makes them happy. Even a small act is better than nothing. And this issue is something that everybody should be aware of." While we chat, people get ready to head towards the festival. The crowd marches down the right-hand side of the road, escorted by police on motorbikes. At the front is a large banner which reads: "Make music, not detention centres." Once we reach 127bis, we take the road that runs alongside the fences, which are several metres high. Across the road is the field where the festival will take place, boasting a stage, food and information stands and themed workshops. Today's event has been organised by the CRER collective (Collective against Raids and Expulsions and for Regularisation), along with a dozen other organisations. The festival has a double purpose: to show support to those locked up in centres like these, and to protest the detention of undocumented people. 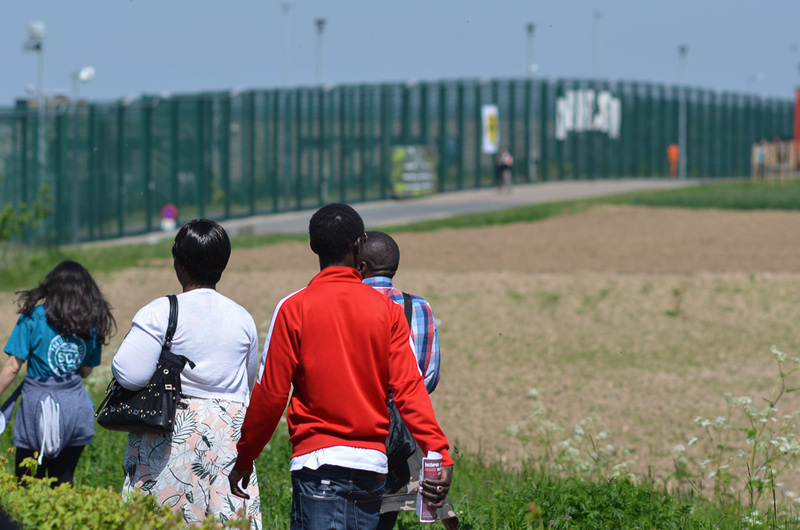 There are five detention centres in Belgium that have sprung up gradually since the 1990s, following what is sometimes known in Belgium as 'Black Sunday', when the far-right had an unprecedented breakthrough in the 1991 general elections. In 1993, the provision of these centres was incorporated into law, with the objective of better organising the repatriation (or repression...) of migrants towards their countries of origin. In 2015, 6,229 people were being detained in Belgian centres. Theoretically, these people cannot stay for more than two months, but under certain conditions this period can be extended. In 2015 for example, an individual stayed locked up for a year and two months. In 2014, the average detention period was as long as 4,432 days. These centres are managed by the Immigration Office, under the supervision of the Minister of Asylum and Migration Théo Francken. Francken is from the nationalist party NVA and has already been under fire for having sent a group of refugees back to Sudan, despite being fully aware of the dangers they risked facing upon their return. What's more, he has just obtained cabinet approval to open another 127bis centre, which will receive families with children. At the moment, there are no underage people in the existing centre. The music begins amid the sounds of planes taking off in the distance, barely noticeable beneath the noise from the speakers. The three bands, who play one after the other, are as diverse as the audience listening to them. The duo Sages comme des Sauvages (meaning 'wise like savages' in French, ed.) have an unconventional style and transcend the idea of territories by playing music from diverse horizons. Watching the crowd eat, drink and dance in complete freedom makes me think even more about those locked up a few metres away in the centre. I have heard that visitors are allowed inside. Curious, I meet Francesca, a CRER activist, who leads me away from the noise to explain that the individuals in the centre must first make a visit request before the CRER can arrange for its volunteers to pay a visit. She also mentions that detainees are only allowed to possess a mobile phone if it does not have a camera or internet connection. I get the impression that this establishment would rather keep its living conditions away from the public eye. Another CRER activist who has been inside the centre tells me about her experiences. Her descriptions of meetings with detainees, which take place in a common room furnished with tables and chairs, reminds me of a typical prison film scene. "The only difference between this and prison is that these people don't know why they're being kept here," she tells me. At some point during their long journey to Europe, undocumented refugees will hear detention centres being mentioned in passing, but they never imagine for a second that they will end up in one themselves. "The first person that I met during a visit really moved me. He said to me: 'Madam, there's a problem here, you know! They don't let us leave.' I felt sick, and couldn't bring myself to tell him that he was basically in a prison. So I used the term "closed centre" instead, like the politicians do." Some people manage to live in Belgium for ten years before being arrested on the grounds of being an illegal migrant. Others only get to see Brussels Airport before being incarcerated. Hervé arrived in Belgium from Cameroon in 2011 for an internship, travelling on a work permit. After his internship, he joined the Free University of Brussels and is now coming to the end of a Masters in Environmental Management. On the 8th of April last year, he was arrested at a roadside checkpoint and was transferred to a detention centre the next day. After a month of being detained at 127bis, he is now free, thanks to support from his university and charitable organisations, as well as his lawyer's relentlessness. The Immigration Office is allowing him a few months to finish his exams and dissertation. Hervé is at Steenrock festival today, and takes to the mic to repeatedly thank those who helped him, before telling the story of his arrest. He only has a few words to say about his time in the centre: "It wasn't easy at all." There are many more accounts of life in the centre throughout the afternoon. A mobile is connected to the stage speakers and detainees are called up.Omar is the first to speak to us from inside, and complains about being banned from attending. The centre has in fact banned all outings this Saturday afternoon, to avoid all contact with demonstrators. Omar tells us about his co-detainees with medical issues, who had to wait much too long before being treated. He says that the the centre is run like "a prison for criminals". 35-year-old Hajid Mohamed also speaks to us over the phone. His regularisation was refused in 2009 and he has been locked up for 40 days, however he is anxious to point out that others he knows have been there for four months. In the background, we hear voices shouting "freedom, freedom", the whole crowd falling silent to let those inside, those who have very few opportunities to express themselves, speak. While 127bis can officially house 120 detainees, the centre is often overpopulated. In the framework of the festival, Belgian and European officials have come to visit the centre. They then make their way to the Steenrock stage. Nawal Ben Hamou, a Socialist Party MP, speaks first. She tells the story of a woman she just met inside the centre, who, before being detained, used to live worry-free with her Belgian husband. "I've heard so many stories, and they are all as dramatic as the next," she tells the crowd. Interrogated about her conflicting remarks on the very existence of these centres, she responds that: "Being placed in a closed centre must only be the last resort. Alternatives need to be developed. Even if detention is necessary, for example for people who are about to be expelled, the detention period must be as short as possible." However, for Fatoumata Sibidé (from the liberal party DéFI), Muriel Gerkens (from the green party Ecolo), Michaël Verbauwhede (from PTB: the Workers' Party of Belgium), as well as the Euro-MP Malin Björk (from the leftist Gauche unitaire européenne), "detention centres must be closed down." "There is a huge sense of hope"
During their speeches, the politicians mention the solitary confinement cells that they saw during their visit. Afterwards, I meet Matthieu Thonon, head of communications at CRER and responsible for the festival's entertainment, to find out more about these cells. 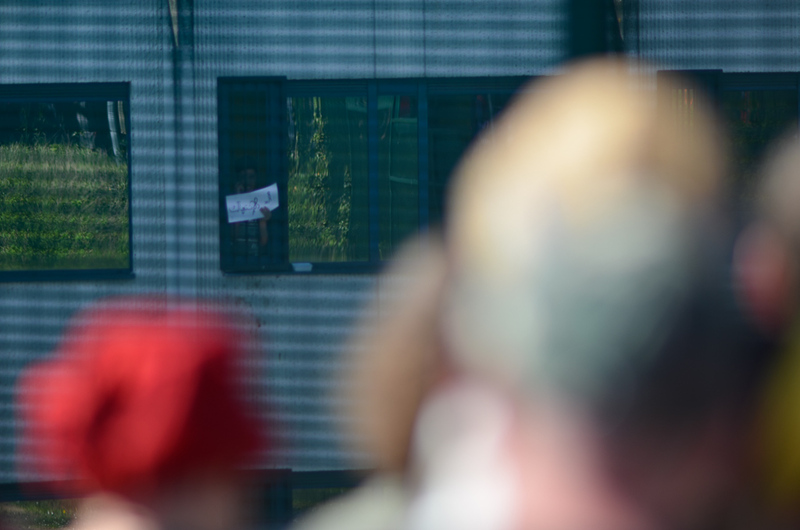 Standing a metre away from the fencing, wearing a t-shirt which reads "No one is illegal", he confirms that there are isolation cells "without windows, without any human contact." "They put troublemakers and complainers in there," he tells me. I ask him about his hopes regarding the impact of this gathering: "Politicians don't change anything, so hope in that sense is pointless. But, at the same time, there is a huge sense of hope because it's regular citizens and movements like these that can really change things. More and more people come to this festival each year, generating a bigger and bigger buzz. Let's hope that it'll turn things around." The CRER and similar organisations may have little hope of changing migration policies in Belgium and Europe, but their work does have a tangible effect. Through fundraising, volunteers are able to buy phone credit for detainees. It is through this method of communication that visit requests are made. The moral support that visitors provide not only allows these individuals to maintain external human contact, it also gives them a trustworthy intermediary through whom they can contact their lawyers. Although the festival has now officially come to a close, the band Scarbone 14 are still playing, and nobody seems to mind. The singer spits out anti-racist lyrics to the sound of guitar and bass, pretty standard stuff, but this band also throw a trumpet and trombone into the mix. Once again, diversity shines through. In the festival's main square, shoulders and torsos may have been charred in the sun but everybody is still dancing. Among the 500 people who have come to the festival to express their solidarity is Marie, a young mother and lawyer. She is here because "these centres need to be back on people's radars. We need to put an end to them." Meanwhile, the Scarbone 14 singer calls on the crowd to bang on the fences as loud as possible so that those inside can hear them. There are supportive messages attached to the fences, as well as shots of refugees taken by the photographer Christian Fauconnier. Several metres away, on the other side of the fenced border that separates us, hands are waving to us, squeezing through the wide steel bars. The double row of fencing, the distance and the barred windows all make it difficult to distinguish faces, but we can hear their cries. I can hear them saying "thank you".